Conference "Diagnostics with the use of MMM"
We provide comprehensive non-destructive testing services for every industry branch. The highest attention is paid to the quality of services provided. 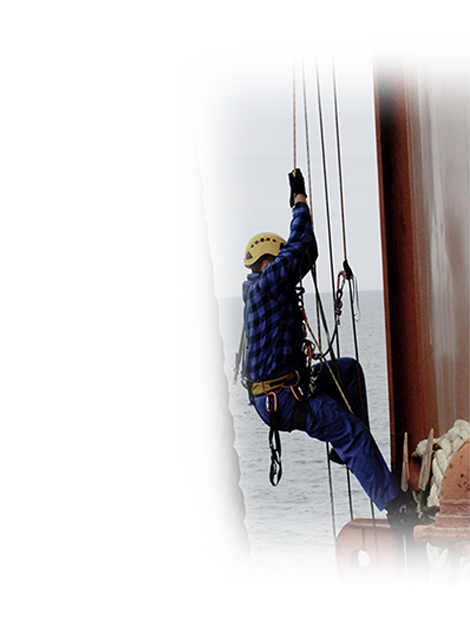 We provide comprehensive non-destructive testing services for every industry branch. We use unique testing methods, including MPM and WIT method. Please refer to our capabilities in the field of EN technical diagnostics. Energodiagnostyka Sp. z o.o. based in Warsaw, is a company engaged in research and development works in the field of technical diagnostics using non-destructive methods. The company's origins date back to 1991. We specialize in research and diagnostics of components, carried out during acceptance works, production, final inspection or periodic inspection during operation. Our representatives operate in Gdańsk and Elbląg and we provide our services across the country and abroad. Our specialists have 2nd and 3rd degree certificates according to PN-EN 9712 and extensive experience in the field of non-destructive testing. From the beginning of the company's activity, we also deal with the implementation of the MMM (Magnetic Metal Memory) method in our country. We carry out such implementations through research and development works directly at the client's and jointly with scientific centers. The MMM method is a passive non-destructive control method, based on the registration and analysis of the distribution of self-magnetic leakage fields (SMLF), created in products and devices in stress concentration zones (SKN). During the MMM tests, a natural magnetization is used, which appears in the form of a magnetic metal memory during actual deformations, which results in structural changes in the material and devices. Energodiagnostyka Sp. z o.o. 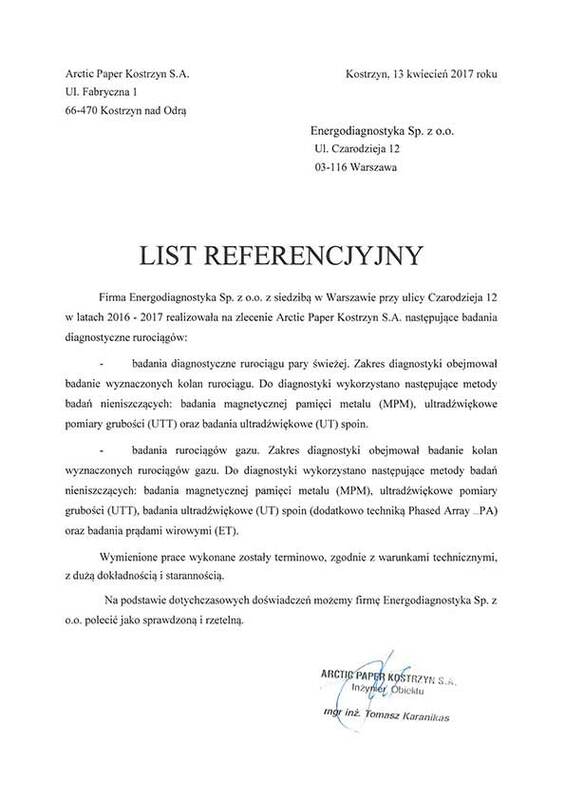 z siedzibą w Warszawie, to międzynarodowa firma prowadząca prace badawczo-rozwojowe w dziedzinie diagnostyki technicznej metodami nieniszczącymi. Specjalizujemy się w badaniach i diagnostyce elementów prowadzonych podczas odbioru, produkcji, kontroli końcowej lub okresowej podczas eksploatacji. 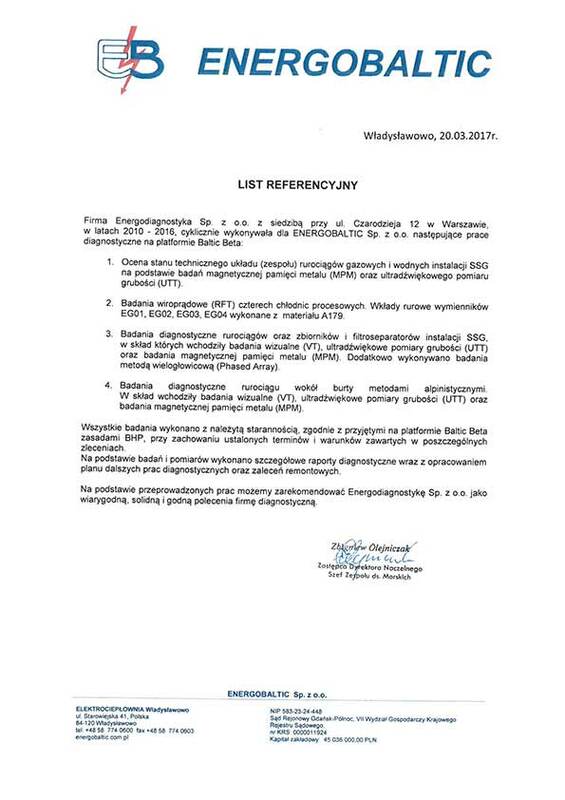 Posiadamy swoich przedstawicieli w Warszawie, Gdańsku, Elblągu, a zlecenia realizujemy na terenie całego kraju oraz poza jego granicami.